If the Tories imagined their narrow lead in the GB-wide Survation poll a few days ago was some kind of turning-point, they appear to have been mistaken. We've since had an ICM poll (albeit one with radical methodological changes) putting them two points behind Labour, and tonight brings word of a YouGov poll putting Labour eight points clear - the biggest Tory deficit for many a year. Of most interest to us, of course, is the Scottish subsample, and the news isn't that great : Labour 36%, SNP 31%, Conservatives 25%, Liberal Democrats 5%, Greens 1%. This is the third subsample that's put the SNP in second place since the election, but it's the first one of those that I take remotely seriously, because the previous two were absolutely tiny Survation subsamples which you could tell were clearly skewed by looking at the past vote recall of respondents. As far as I know, YouGov still weight their Scottish results separately, which means they should produce results that are slightly more accurate and stable than other firms' subsamples. However, even when properly weighted, a subsample has a much greater margin of error than a full-scale poll - I make it roughly 8% in this particular case, which means YouGov's figures are entirely consistent with a small SNP lead. I still think that's the most likely state of play, because in total we've had six subsamples since the election, with three putting the SNP in the lead, two putting Labour in the lead and only one putting the Tories ahead. It's also significant that the SNP haven't been in third place in any of the subsamples, whereas both Labour and the Tories have. However, even if the SNP do still have the advantage, it's plain enough that we're faced with a fairly tight three-way battle for the time being. 'For the time being' are the operative words, because it's entirely predictable that a major political shock like the one we saw last month will radically shift the opinion polls in the immediate aftermath. Sometimes the change is superficial and temporary (for example the brief Conservative surge during the fuel crisis of 2000 which was completely reversed at astonishing speed), and sometimes it's meaningful and lasting (for example the Tory slump after Black Wednesday in 1992, which they didn't properly recover from for well over a decade). We'll just have to wait and see which category the current situation falls into. The irony is that if Labour have hopes of exploiting this apparent moment of relative vulnerability for the SNP and winning back a truckload of central belt seats, their own strength in the opinion polls may end up preventing them from doing so. The Tories aren't going to willingly call an election unless they think there is a good chance of winning an overall majority, and as I've noted before, there is no realistic prospect of them being forced into an election by a vote of no confidence in the Commons for at least three years (unless Tory MPs defect to other parties). The more I've thought about the parliamentary arithmetic, the more I've come to the conclusion that it's not totally inconceivable that the new parliament will stagger on for the full five-year term. The Tories are very lucky that the exit poll was wrong about them only having 314 seats. The difference between 314 and 318 may not sound all that great, but it could well be enough to swing the balance between a very short parliament and a very long one - which apart from saving the Tories' bacon, could also rescue the SNP from having to defend their own 35 seats for a good number of years. Ideally Scotland will be an independent country by 2022 (Nicola Sturgeon's recent statement very much leaves that possibility open), but even if it isn't, Labour could be in a completely different place by then. There are already plenty of signs that the truce between the Corbynites and the "moderates" is starting to break down. "I know I’m not the only Tory who somehow hopes Ruth Davidson becomes an MP before the next Tory leadership election but I suspect she sees her role for the next few years as ensuring Scottish Nationalism really is killed stone dead and that can only be achieved in Holyrood and not Westminster." Which suggests that Scottish nationalism hasn't "really" been killed stone dead thus far? Well, quite. It's a tad difficult to boast about killing Scottish nationalism when you've only just been beaten by Scottish nationalists in a sixth successive nationwide election. The roll of shame for Ruth is : the 2012 local elections, the 2014 European elections, the 2015 general election, the 2016 Scottish Parliament election, the 2017 local elections, and the 2017 general election. Every single one an SNP victory. Just a very quick note to let you know I took part in a live stream on Independence Live earlier today, answering questions on a variety of topics related to the current political situation. You can watch it HERE. Just very, very occasionally (maybe once every four months or so) Christopher Silver sends me a passive-aggressive tweet with a "Don't diss the intelligentsia, man!" subtext. Today was one such occasion. Clearly even the mildest criticism of Neal Ascherson was just too much to be borne. 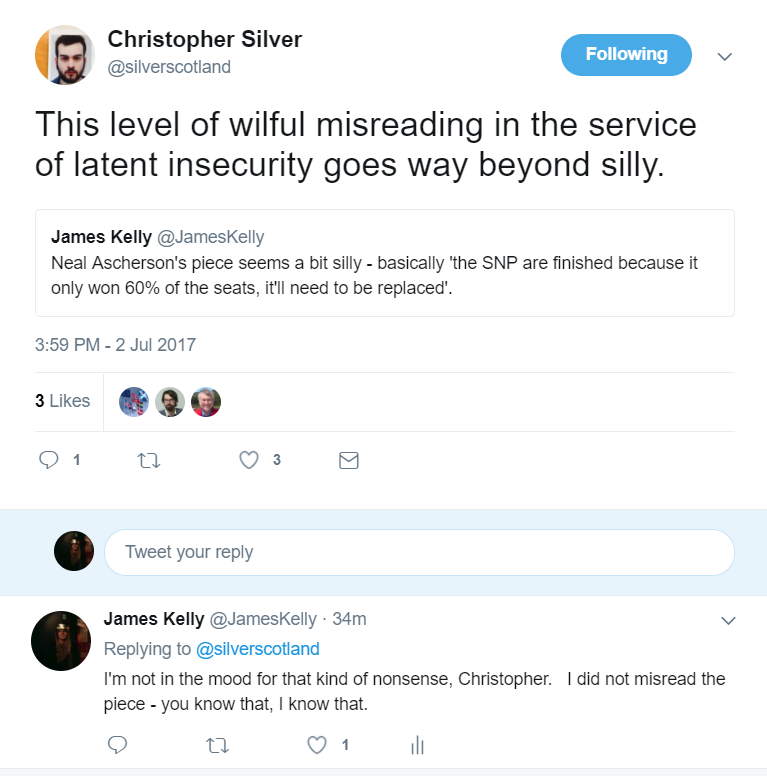 Free from the constraints of 140 characters, allow me to briefly set out why I did not misread Ascherson's Sunday Herald piece, whether wilfully or unwilfully, "in the service of latent insecurity" or otherwise. In the fourth paragraph of his article, Ascherson says this : "What’s true is that the SNP and their leader have been seriously damaged – possibly holed below the waterline in ways which aren’t yet visible. What isn’t true is the assumption that independence sinks or swims with the SNP’s fortunes." In paragraph 8, he expands on what he means by that : "Neither can we know who will surf that tide. But it might well not be the SNP...it could be some hybrid, say a rebel Scottish Labour Party linked with the Greens and radical seceders from the SNP, which finally leads a free Respublica Scotorum out into the world. Less probably, it could be a much angrier, more impatient formation now hidden in its chrysalis. Remember how Sinn Fein came from behind and wiped out the Irish parliamentary Home Rulers in 1918?" In paragraph 9, he also speculates about the possibility of Tories leading Scotland to independence. In fairness to Ascherson, there is plenty of "possibly" and "might well not be" in there, but I scarcely think it's unreasonable to detect in those segments of the article an assumption that the SNP and Nicola Sturgeon are probably on the way out (and that unambiguously refers to the general election result which saw the SNP win almost 60% of the seats), that the independence cause will survive this upheaval, and that independence supporters will find another vehicle to deliver their goal - which might involve some wildly implausible alliance of pro-indy Labour rebels and the Greens. For those like Christopher who think that anyone who is dubious about this prospectus must simply be an 'insecure SNP supporter', I'd suggest it might be a useful exercise to look at the current political landscape in Scotland in a hard-headed way and try to work out what a truly objective person would think is the most promising road-map to independence in anything like the foreseeable future. Is it likely to involve in some way a pro-independence party that currently holds almost 60% of Scottish seats at Westminster and almost 50% of the seats in the Scottish Parliament? Or is the vehicle more likely to be an as yet unformed splinter group from a much smaller party that has been rabidly anti-independence for as long as anyone can remember? The answer seems self-evident to me, and if others disagree, perhaps they'd better explain their reasoning in a rather more credible way than they have thus far. Pipe-dreams could tie us up in knots for decades. The notion of a new right-of-centre pro-independence party perhaps isn't quite so fanciful, because at present pro-indy Thatcherites don't have a remotely comfortable home in either the Tories or the SNP. However, people have been talking about that sort of thing for decades and nothing ever materialises, so it appears the critical mass simply isn't there. Even it did happen, the chances are that the new party would have to work with the SNP to bring independence about (and that the SNP would be the senior partner in that arrangement). Leaving aside his musings about how the SNP might be replaced, Ascherson's article is primarily about the notion that Scotland should act as if it already is independent, and that the Scottish government should essentially exceed its legal powers and only stop doing so when the UK government forces it to. I don't have any objection in principle to that, but a more practical objection is that the UK government won't necessarily be the obstacle - where legislation is involved, it would first have to get past the Presiding Officer and his legal advisers. This post is really just an indulgence of a point of pedantry, but it's been bugging me since the election that people keep saying that Jeremy Corbyn would currently be Prime Minister if it hadn't been for the twelve Tory gains from the SNP (indeed, in my weaker moments I may even have retweeted the people who are saying it). It's not strictly true. From there's it's a simple calculation - the Conservatives and DUP combined would have had 316 seats, and an informal progressive alliance consisting of Labour, the SNP, Plaid Cymru and the Greens would have had only 314. Sinn Féin are irrelevant because they don't take their seats, so the balance of power would have been held by the 12 Liberal Democrats and the sole independent MP Lady Hermon (who we know is minded to support the Tories in confidence votes). That means the only way the Queen would have been able to justify not inviting Theresa May to form a government would have been if the Liberal Democrats had clearly indicated a preference for Jeremy Corbyn. Based on the commitments they made prior to the election, it seems highly unlikely they would have done so. What would have happened after May's reappointment as PM? Without an overall majority for the Tory/DUP alliance, it's theoretically possible that the Queen's Speech would have been defeated, triggering a second election almost immediately. The public would not have looked kindly on that, so much more probable is that the Tory government would have introduced a limited and uncontroversial Queen's Speech, allowing the Lib Dems (and possibly even Labour) to abstain with dignity, on the implicit understanding that there would be a general election in the autumn. There's no doubt that without the Scottish Tory gains we'd be in a radically different situation from the one we actually find ourselves in - the Tory government would be merely a caretaker administration with almost no capacity to get its policies through the Commons, and a quick second election would be a near-certainty rather than just an intriguing possibility. But even so, it's simply not true to say that the Scottish Tory gains are literally responsible for there being a Tory government as of this moment. In the longer run, what would have happened in a second election is entirely a matter for speculation - for all we know, the urgency of the situation would have concentrated Tory minds, and they would have quickly found an alternative leader who might have delivered a much better result in the autumn. There is no shortage of little paradoxes to be found in politics, and it's not totally inconceivable that the Scottish Tory gains will ultimately leave the Tory government in a weaker position than would otherwise have been the case.